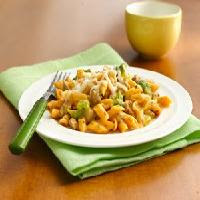 Perfect for a busy weeknight, this quick-fix meal stars Hamburger Helper® dinner mix, ground turkey, broccoli cuts and creamy mozzarella cheese. In 10-inch skillet, cook turkey over medium-high heat, stirring occasionally, until no longer pink; drain. Stir in milk, hot water, uncooked pasta and sauce mix (from Hamburger Helper box), oregano and pepper flakes. Heat to boiling. Reduce heat; cover and simmer 5 minutes, stirring occasionally. Stir in broccoli. Cover; simmer 5 minutes. Sprinkle with cheese; cook uncovered until cheese is melted. Calories 370 (Calories from Fat 110); Total Fat 12g (Saturated Fat 5g, Trans Fat 0g); Cholesterol 80mg; Sodium 900mg; Total Carbohydrate 32g (Dietary Fiber 2g, Sugars 7g); Protein 33g. Daily Values: Vitamin A 15%; Vitamin C 15%; Calcium 30%; Iron 10%. Exchanges: 2 Starch; 0 Other Carbohydrate; 0 Vegetable; 3 1/2 Lean Meat. Carbohydrate Choices: 2. This entry was posted on 9:24 PM and is filed under Turkey . You can follow any responses to this entry through the RSS 2.0 feed. You can leave a response, or trackback from your own site.